There are many different parts that make up Language Arts. From phonics to poetry. But what if I told you that you could use one resource for Language Arts and cover all your bases! That’s just what I have been doing with McKenzie, my 1st grader, for the last few weeks. Let me tell you more about it! There are several different approaches to learning how to read. Some programs teach reading by learning sight words while others like Eclectic Foundations take a classical approach to learning phonics. With the help of the timeless classics, McGuffey Readers, your child will learn Phonics, Grammar, Spelling, Reading Comprehension, Handwriting, Composition, and Poetry using the Eclectic Foundations Language Arts, Level B. Since I opted for Digital resources I printed and spiral bound the Teacher’s Guide at home. I printed the Student Book and placed it into a binder because it is a thicker book. I also opted to print the Phonics Practice Sheets and Word Cards and store them inside the binder in sheet protectors. We also received a link PDF of the McGuffey’s First Eclectic Reader. This can also be found online for free. I was able to open the Reader on McKenzie’s Kindle for use during our lessons. 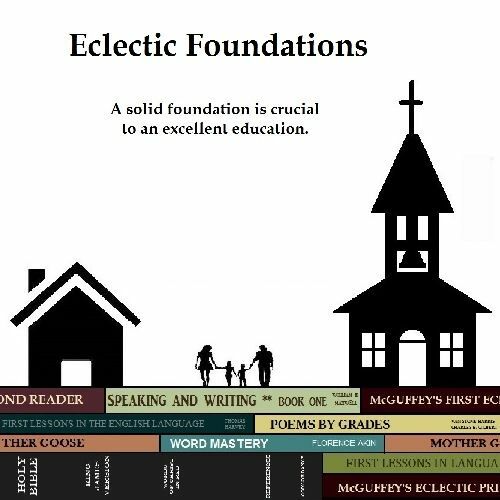 Currently Eclectic Foundations is available to purchase in three levels of instruction. The fourth level will be ready for release in April 2017. Options include either physical or PDF download for the program. Each of the 144 lessons in Level B are taught from a Biblical Worldview and are intended to be used 4 days a week for 36 weeks. 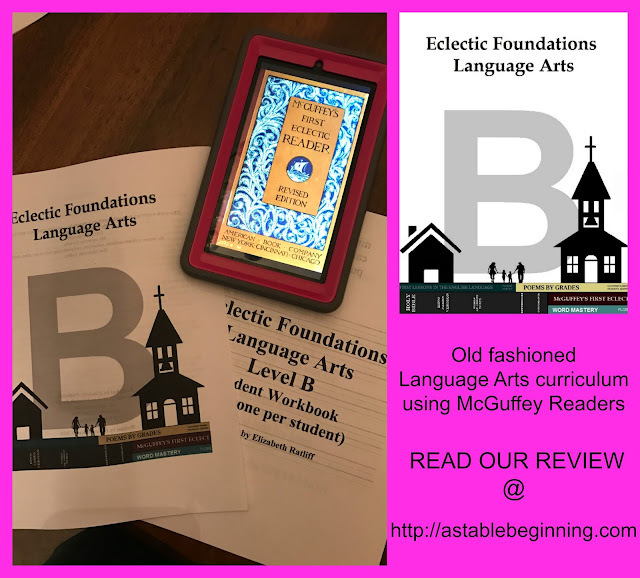 Reading lessons are typically covered two times a week in the McGuffey Reader. The first day is spent studying the picture and reading the words while the second day is used to study and review parts of speech. Coloring the word cards is also done. Each part of speech is broken down with a color-coded color throughout the program. For example Nouns are red, pronouns are pink, adjectives are orange, verbs are green, adverbs are yellow, prepositions are blue, conjunctions are purple, and interjections are black. McKenzie is not a big colorer but she especially enjoyed coloring her words and these color-coding the parts of speech is helping her to remember them. Phonics lessons at this level are not to be confused with Spelling lessons that start in Level D. The intended purpose in Level B is to get the student reading the words comfortably. A short list of words are covered in each lesson that are meant to be read three to four times. Handwriting practice includes cursive writing at this level. A gentle review begins by going over each letter in the alphabet. Five lines for practice are included on the page. It it recommended to use the first two lines for the capital letter, the next two lines for the lowercase letter practice, and the final line to review letters the child needs extra practice with. I have found it helpful for me to use a highlighter and write the first lines of the capital and lowercase letters so that McKenzie may trace them out first. In future productions of this program I would suggest that as an upgrade, especially when children are used to printing their letters. She just needed a little more help. Once letter formation is introduced the student moves on to copying short quotes. This can either be done on a slate board or on the provided lines within the Student Book pages. Poetry is offered each week along with comprehension questions about the poem. It is suggested to help the student find the rhyming words by circling them in different colored crayons. Grammar is taught with lessons from First Lessons in English. The program teaches a little bit above grade level but it is only meant to be an introduction at this level. The McGuffey word cards and grammar lessons are meant to compliment each other, but don’t be alarmed if your child struggles with the grammar portion. I love this program for first grade! McKenzie loves it too especially since she now knows how to write her first name in cursive! This program is classical in learning style and very affordable for everything the program offers. 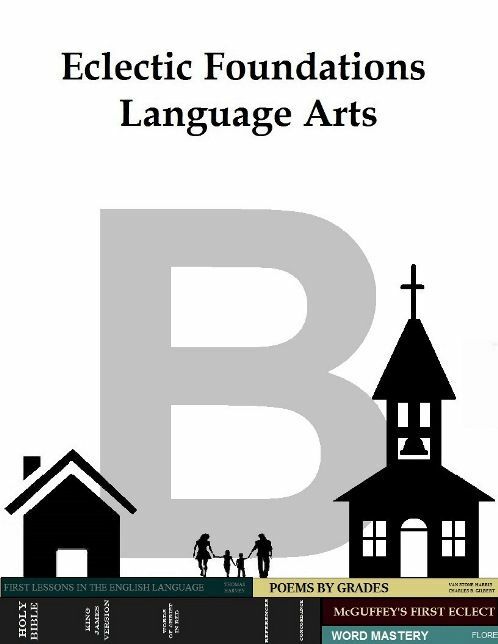 Normally I would have a separate program for each LA area covered, but with Eclectic Foundations my daughter is getting everything she needs with one program! I love that it is rigorous, yet gentle, and contains no "fluff"! Your child will have a strong foundation in grammar for many years to come. I am super excited that the program is expanding and offering a Level D program for 5th/6th graders in April. I will be using Level C with McKenzie when she finishes her current level and using Level D in the fall with my rising 5th grader! Be sure to check out what my CrewMates thought of Level B and the other levels reviewed, Level A and Level C, by clicking the banner below.